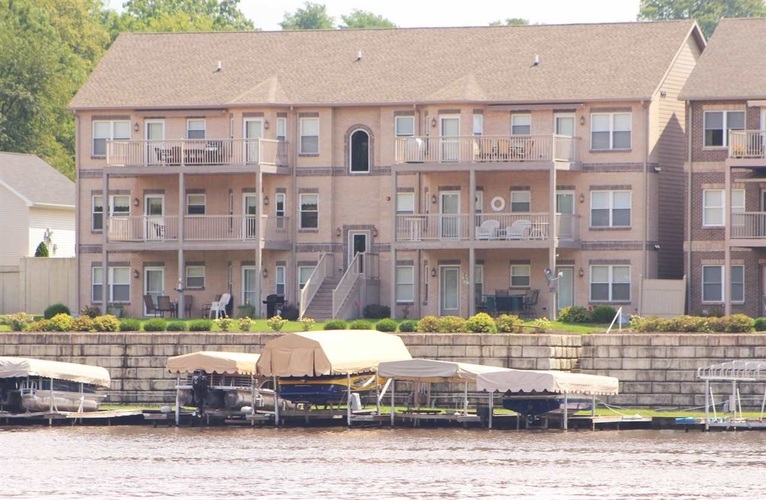 Live the hassle free Lake life on main Lake Freeman! You can take full advantage of lake living from this maintenance free condo. Just come and enjoy! High end finishes inside include hardwood floors, tiled bathrooms, granite countertops, stainless steel appliances, & a large lakeside composite deck with roll-away-sun shades. A comfortable open concept floor plan that offers a large kitchen with an island, dining area, and living room with windows facing the lake views. Also, the master bedroom has a walk in closet and access to the lakeside deck. In addition, this is one of the few units that has an attached garage (11x24) that leads directly to the inside of the condo. Recent upgrades include a new water heater, stack washer & dryer, & window treatments & deck shades. Icing on the cake: boat ramp, community pool with bathrooms, boat dock & space for lift, all exterior maintenance included, & a short golf cart drive away is the popular Sportsman on Lake Freeman, Kopecetic beer factory/brewery/restaurant, & Madam Carrol river boat. Offered turn key so basically all you have to do is start enjoying the lake! Listing provided courtesy of REAL ESTATE NETWORK L.L.C.